One of the things that got me jazzed enough to start a blog was Delta's idea of using stones for encumbrance. I've mentioned it before, but it seemed like an elegant way to simplify and add detail to the game (the later because you could use encumbrance at all, with its complexity few people seem to). But even tracking weight in 15 pound increments doesn't seem to make it easy enough to engage encumbrance at my table. I know it's easy enough for me to stop and explain, even tally up the player's gear for them, but I don't want to bog things down, and there's enough going on for new players to digest anyway. So encumbrance has pretty much been handwaved in my sessions so far. But it seems encumbrance is essential for a resource management game and I want the drama of decisions players will have to make when they have to leave some treasure behind. So how to do it. Here's an idea: checkboxes. The idea is, if you have something visual and simple enough, you might be able to tell players to track their own encumbrance. Basically check a box for every stone of gear your carrying (my equipment list already has weights in stone so they don't need to convert.) Also, players will clearly see when they click over into a slower movement rate. To keep things simple you could abstract this enough so that you have one set of checkboxes for all characters, but that really short changes the exceptionally strong and sort of defeats the purpose of having a strength stat. 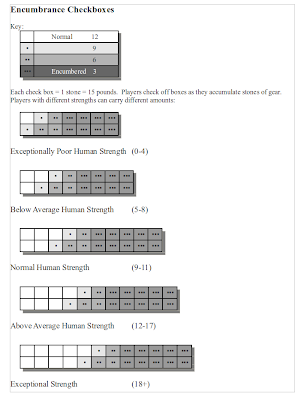 I decided to split the difference and try five, average strength and two categories above and below. Here's a pdf of what I mocked up. I wanted to put little silouhuettes of a figure stooping as it carried more and more weight, which I think would clearly communicate what the boxes meant- carry more, move slower-- but alas, artwork has been thwarting me today (I was looking for several other things with no luck). If I use this it means I'll have to have several sheets of these ready and cut the appropriate one out for a player when a new character is made. Messes up the simplicity of just using blank index cards but maybe the price is worth it. I 'll have to try it out and see if its still too cumbersome ;) for play. If you can get your hands on a scan of the Outdoor Survival counters that may do the trick, as far as human figures getting stooped over. Me, I like Raggi's LotFP encumbrance system. Even simpler - each line on your equipment sheet is a weight, light objects have their own box and a few heavy things may count as more than one. Thanks! Both great additions to the conversation. I have outdoor survival and will see about scanning the counters. The silhouettes are more of people dying of exposure but they aren't that far off of someone stooped under a load. And I hadn't seen LotFP's handling of encumbrance. 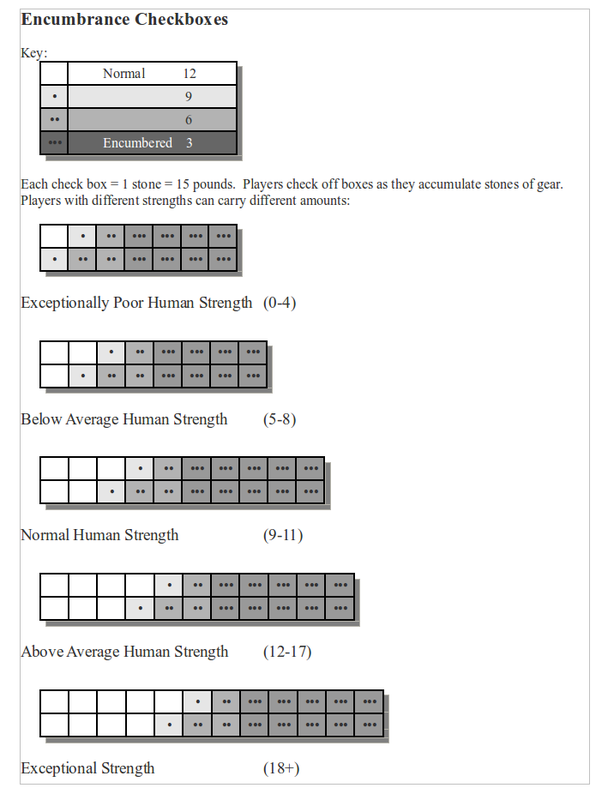 I swear as I published my post and went to bed I was thinking about tracking encumbrance in a similar way: every line on the character sheet just ticks you closer to a higher level of encumbrance. But I balked at the idea of potions and daggers equaling battleaxes in encumbrance. And he seems to balk at that too, because he's added "points" in his system with oversized items costing more points and worn items (except armor) costing none. The easy solution quickly gets complicated. I'd say adventure gaming in a nutshell is about abstraction, turning the world into rules with just enough detail, but not too much. Encumbrance is fascinating to me in that pretty much everyone agrees the player choices it adds to the game are good but the implementations are too cumbersome. Encumbrance is the touchstone. At the risk of spamming my own blog, I wanted to add that I hope I didn't seem too dismissive of Raggi's idea. It really is elegant. If I can tweak it a little it might work better than what I just posted (no math). Let me think about this for a while and see what I can come up with. I like this idea. I'll give it a try at our next session and let you know how it goes. Does anyone have a link to Raggi's encumbrance system? I don't think I've seen it.